In honour of the big day tomorrow, I thought I'd toot my own horn a bit and highlight some of my "scariest" jewelry. As you may know, besides my knitting, I am an avid bead weaver. I really enjoy making seed bead rings and especially bracelets. I do make the occasional necklace, but I sometimes lack the patience to complete them. Seed bead jewelry is a very time consuming process. I use nothing more than a very fine beading needle, some thread and seed beads. There is no base material or fabric. Each bead is sewn to the bead before, in some cases, beside it. You can think of it as drawing pictures and creating patterns one pixel or dot at a time. The time it takes to create a piece depends on the complexity of the pattern, width and length of the piece. For example, a piece like the multi-skull bracelet above can take anywhere from 3-4 hours to create. 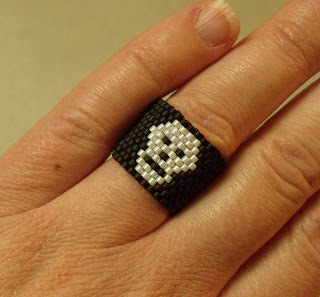 A ring like this with a single skull on it would usually be about an hour. A ring with multiple skulls will usually take a bit longer if a certain ring size is required. It takes a bit of trial and error with the pattern to know how many black seed beads I'll need to leave between the skulls. I also like to use a cool or unique beads as focal points in my work. 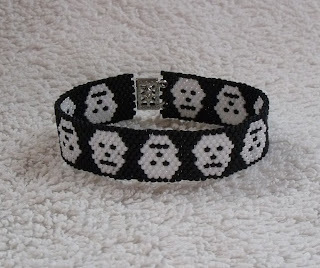 A great example is when I stumbled across these fantastic skull beads online. I absolutely LOVED them and had to have them. For what, I wasn't sure at the time, but like may things, I can always find a use and a space. Eventually. The bracelet shown here is actually an example of a bead weaving technique that I developed over the years. It is a pretty easy technique to learn and I do offer the tutorial online in a variety of ways. The easiest would probably be through my Etsy shop or as an instant download through PayLoadz. In both instances it's a *.PDF file you can open on any device or computer. On a whole, this process is much less time consuming than the other style of bead weaving I do. A bracelet such as this one would take usually under a couple hours to complete. I absolutely adore this ring! I was wondering if you ever do tutorials and post them to youtube? I am a beginner with beading and I wish I could do this, I just have no idea how to stitch the beadsside by side like this. If the links don't work, just copy and paste them into your address bar. You'll go right there. thank you i love the ring !